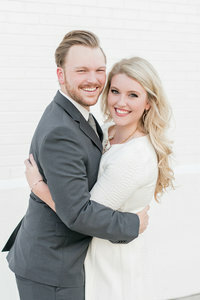 Emily and Barrett have been together since high school. At their reception, they displayed photos from their younger years including their prom portraits and photos from high school formals. They were such babies at the time, but even then, they were so in love! We loved watching their love on their wedding day and noticing how it had evolved. They are no longer children, but adults with careers and accomplishments. Their love is mature and deep, and so obvious from the outside looking in, but what seems to have never changed is their friendship and sense of partnership. These two were made for each other. The wedding day was beautiful. We began the day at Birmingham’s historic Tutwiler Hotel where Emily and Barrett got ready with their friends, listened to music, and popped champagne! Unfortunately, though, as the music blared from their hotel rooms, a rainstorm ensued outside (cue Alanis Morrisette again!). We think, though, that this was the most romantic rain storm that ever occurred, because the rain and the light paired with Emily and Barrett’s “don’t sweat the small stuff” attitudes, we were able to achieve the most gorgeous rainy day portraits! You’ll see what we mean below. You’ll also notice the amazing celebration that happened during their reception. We think every single person in the room got up to dance at some point during the party. It was incredible! Emily and Barrett, you two are so cool. You just are. You are the kind of people we just love being around. We love your cool, calm, and collective personalities and we so appreciate your enthusiasm and bravery to embrace the rain on your wedding day and to change a perceived negative into a beautiful, romantic positive! And more than that, we appreciate who you are. We have grown to love you both so much, and we’re so thankful that you allowed us to be a part of such a phenomenal celebration of love. Congratulations, you guys!